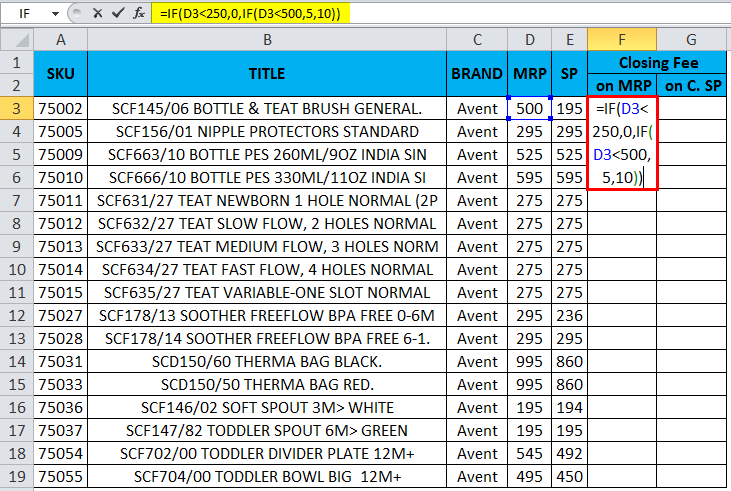 Multiple IFS in Excel (Examples) | How to use Multiple IFS Formula? In Microsoft excel IF function is one of the most important functions which is mostly used to check the logical condition (TRUE or FALSE). The IFS function checks if one or more than one conditions are observed or not and accordingly returns a value that meets the first TRUE condition. Value_if_true: This will return the value as TRUE if the specified condition is met. Value_if_false: This will return the value as FALSE if the specified condition is not met. For example, if we have the formula as =IF(A2=2, “TRUE”, “FALSE”) which means that IF A2=2 the if the function will return TRUE or else it will return FALSE. Multiple IFS in Excel is very simple and easy. 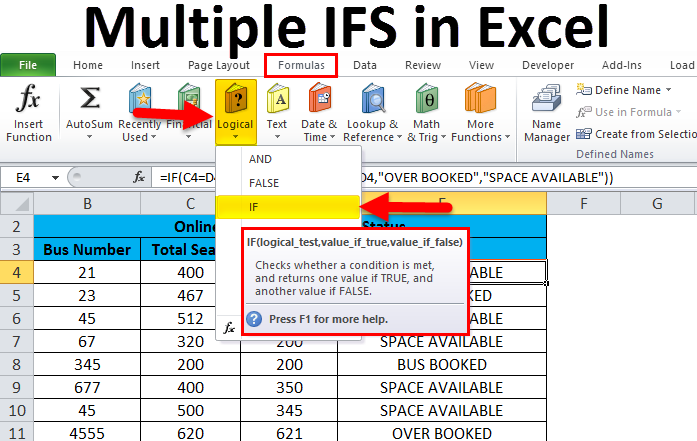 Let’s understand Multiple IFS in Excel which are as below. 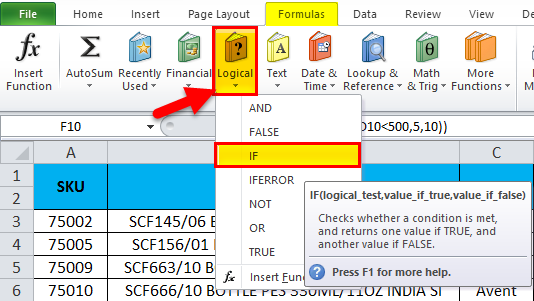 In excel we can find the IF function which is categorized under LOGICAL condition group in the FORMULAS menu which is shown in the below screenshot. In this example, we will learn how to use the IF function by using the simple example. Consider the below example where we have student’s marks with the subject which is shown below. Here we will use the IF condition to find out student’s status whether he got PASS or FAIL status by following the below steps. First, select the cell E2. Apply the formula and press enter so that we will get the output as follows. We can use multiple IFS statement in excel to check two or more condition at a time by using the same IF condition syntax. In the below example we will see how to apply multiple IFS. In this example, we will learn how to use the multiple IF function by using the simple example. 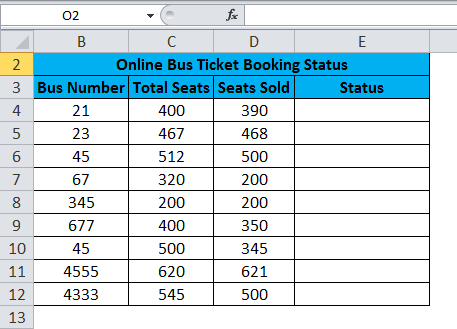 Consider the below example where we have Online Bus Ticket Booking System where we need to know the booking status whether all the seats are booked or not. In such cases, we can use the Multiple IFS function to derive the output. The online booking status example which is shown below. Here in the status column, we will use the Multiple IF function by following the step by step procedure as follows. First, select the cell E4 which is nothing but the Status column. We are going to apply the above condition by using Multiple IFS. Type Opening bracket and select C4. 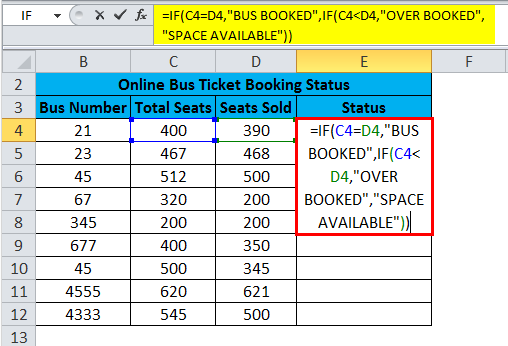 Now insert another IF condition and open the brackets stating that by checking the condition as C5<D5 (TOTAL SEATS=SEATS SOLD) then in the double quotes type the text as “OVERBOOKED “or else we need to mention the status as “SPACE AVAILABLE”. Next, close the IF condition bracket for Multiple IFS. If we combine the above IF we will get the Multiple IFS statement which is shown below. 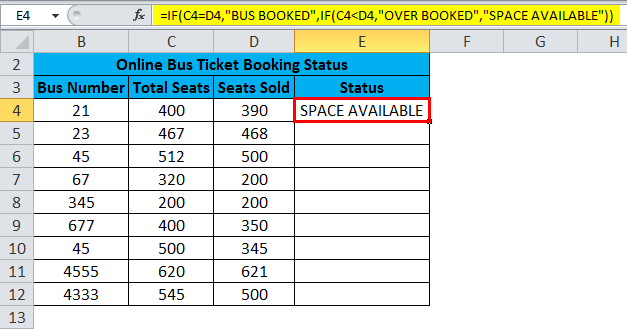 =IF(C5=D5, “BUS BOOKED”, IF(C5<D5, “OVERBOOKED”, “SPACE AVAILABLE”)) which is shown in the below screenshot. Once we apply the Multiple IFS we will get the below output status which is shown below. 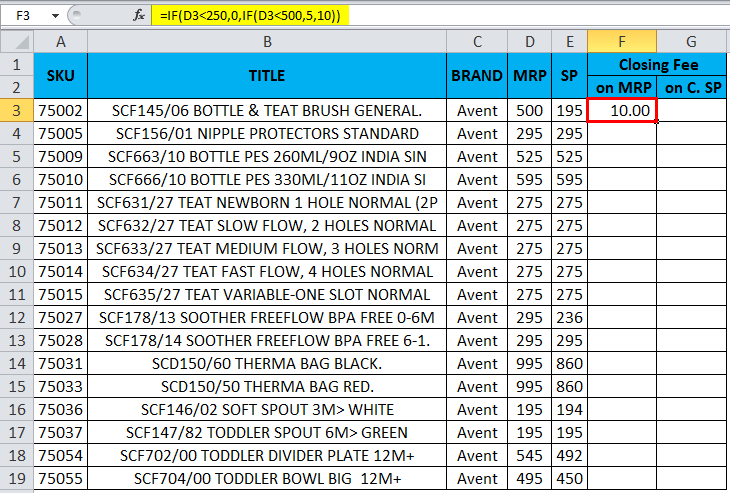 Drag down the formula for all the cells so that we will get the below output result which is shown below. In this example, we will see how to use Multiple IFS using the numeric value to display the status. Consider the below example which shows MRP and SELLING PRICE where we need to find out the closing FEE for Amazon, here we will use the Multiple IFS to get the CLOSING FEE for both the MRP AND SELLING PRICE by following the below steps. Apply the Multiple IF condition statement by checking the condition as IF MRP is less than 250, mention the closing fee as zero or IF MRP is less than 500 mention the closing fee as five(5) or mention the closing fee as ten (10). Next we need to apply the Multiple IF condition for SELLING PRICE Closing Fee by checking the condition as IF Selling Price is less than 250 we need to get the closing fee as Zero(0) or IF Selling Price is less than 500 we need to get the closing fee as five (5) or else we need to get the closing fee as ten (10). We are going to apply the above two condition by using the Multiple IFS in both the column. First, insert the IF statement in F3. Type Opening bracket and select D3. Apply the condition as D3<250 MRP<250 then display the closing fee as Zero and Insert comma after that. Now insert another IF condition and open the brackets stating that by checking the condition as D3<500 the display the closing fee as 5 or else display the closing fee as 10. =IF (D3<250, 0, IF (D3<500, 5, 10)) which is shown in the below screenshot. In the above screenshot, we got the closing fee for MRP as 10 how? Because first IF condition will check for the first condition as IF 500<250 we will get the closing fee as Zero here the condition is TRUE and excel will check for the another IF condition which states that IF MRP<500 we will get the closing fee as five or else IF condition will display the closing fee as 10. Here in this example, MRP is 500 which checks the condition as 500<500 here it’s more or less equal to condition, So IF condition will display the closing fee as 10. 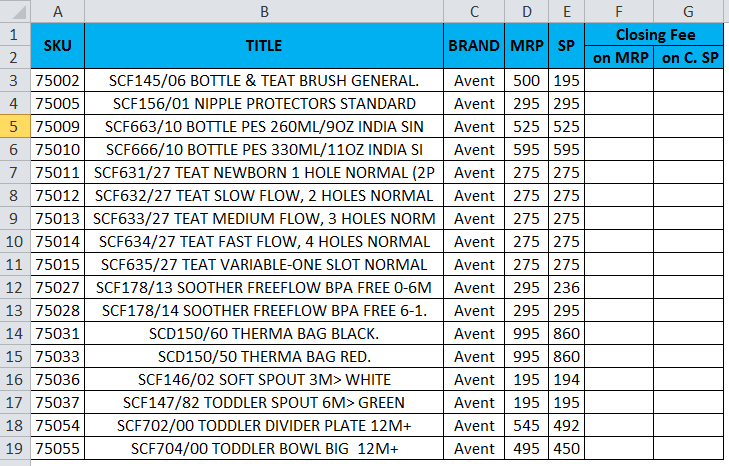 Drag down the formula for all the cells so that we will get the below result. When we use string in excel, Multiple IFS makes sure that we always enter the text in double quotes or else statement will the throw the error as #NAME? While using Multiple IFS make sure that we have closed multiple opening and closing parenthesis or else we will get the error alert stating that formula applied is wrong.